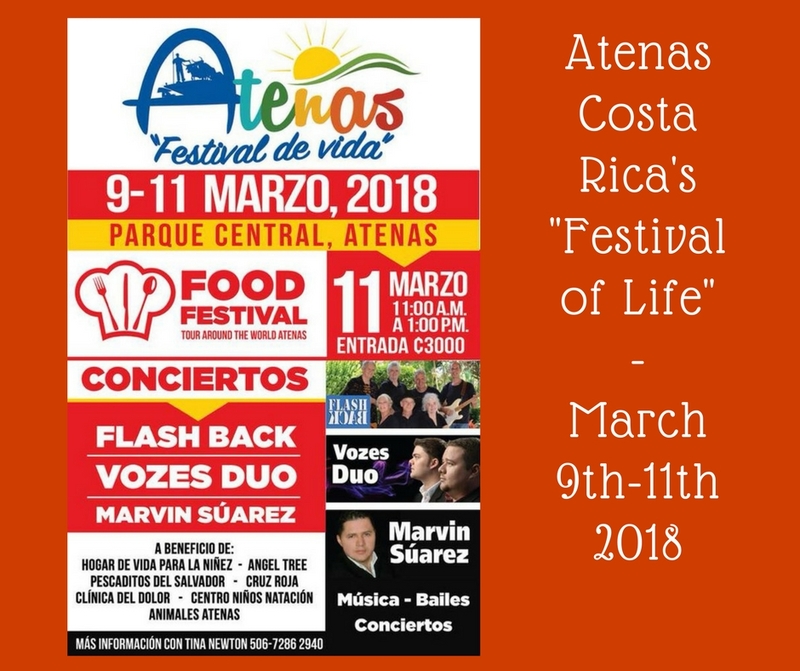 Visit Atenas Festival of Life Mar 9th-11th-2018. On Sunday from 11:00 AM – 1:00 PM the Food Festival will take place benefiting the Hogar de Vida Children’s home in Atenas. Entrance tickets to the International Food Festival will be 3,000 Colones to the public and all proceeds benefit the Hogar de Vida Children’s home in Atenas. This is where you will get to taste samples of International foods. Come and taste other foods from around the world, help the kids, and have fun! Then from 1:00 PM to 3:00 PM, live in concert, the FLASHBACK Band will play. There will be a raffle to benefit other local organizations such as the Red Cross, Animales Atenas, Angel Tree, Swim for Life, and the Hogar de Vida children’s home and more. Other concerts will follow through-out the day and evening until the end of the first Festival of Life at 10:00 PM. Plan to come to Parque Central next week-end and enjoy the food, fun, music and lots more!